Napa Valley, California is hosting Better Bag Month in October. The county is giving away reusable shopping bags at various locations throughout Napa Valley to promote the use of eco friendly reusable bags. 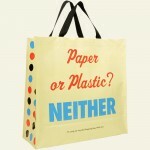 Napa Valley wants it’s citizens to stop using plastic bags when ever possible and is doing something about it. So for the entire month, Napa Valley CanDo, a local community service organization, is promoting Better Bag Month as proclaimed by the Napa City Council. Napa Valley Cando members will distribute free, reusable shopping bags at local stores and ask local residents to pledge to use reusable bags and discontinue accepting plastic bags at check out. Napa Valley CanDo brings together people from all over the Napa Valley who want to volunteer to help the community. There are no dues and no required service hours. The organization sends out a weekly email to it’s members that highlights the activities being organized and the need for volunteers when needed. The goal has been to encourage greater community involvement and volunteerism by easing the path from intent to action. If you would like to find out more information about Better Bag Month or what kinds of community outreach programs the Napa Valley Cando organization does for California, go to their website, Napa Valley Cando.